1. Krakauer is one of those welcome characters in life, who have the ability to change my opinion of a certain instrument. 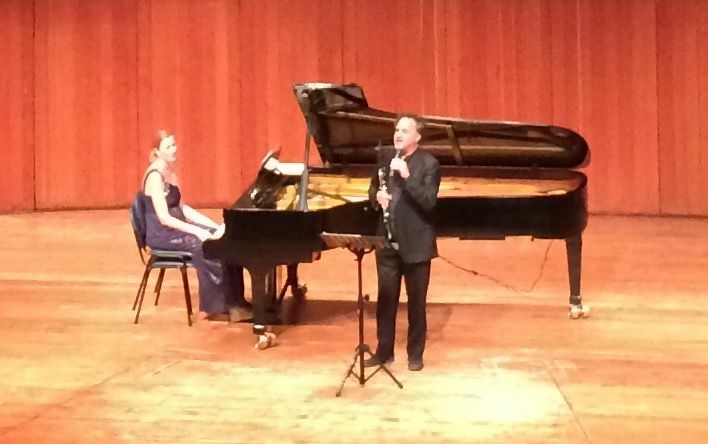 The clarinet has always been on my B list, but during Krakauer’s performance last Saturday I heard an entirely new dimension to it’s sound. I was reminded that Brahms’ own revelation about this instrument after hearing Richard Mühlfeld play, inspired him to compose the sonata we were hearing. Both Krakauer and Mühlfeld must have developed a high level of skill to produce such a variety of sounds, from lyrical, smooth, mellow warmth to brassy rhetorical insistence. Krakauer has also developed a mastery over the circular breathing technique, which I have not seen in western classical music – although it is widely used in folk and “world” music. This technique allows him to maintain ideal air pressure at all times, by taking in or releasing air through his nose. Understandably, this opens a lot of doors for a wind player, most notably: sustaining long passages that lead into dramatic runs without having to stop for a breath. Tagg’s brooding, contemplative piano was suitably Brahmsian – rhapsodic, dexterous, and occasionally bullish, with breathtaking muted ppp avenues. 2. This duo has the skill to play familiar works with fresh interpretation, as if performing it for the first time. The wistful adagio was deeply romantic, even Renoiresque. Krakauer’s belief-defying continuity in breathing enabled a seamless impressionism, and carried the movement to a barely audible fade. 3. It is lovely to watch Tagg and Krakauer playing from the same invisible page where mood and phrasing are written. Their synergy of interpretation travels immediately to the audience, suggesting that at this point in Brahms’ life, he was not overly concerned with impressing anyone, and was merely composing for the simple enjoyment of the sounds he was hearing. 4. I enjoyed experiencing such a wonderful work being celebrated. 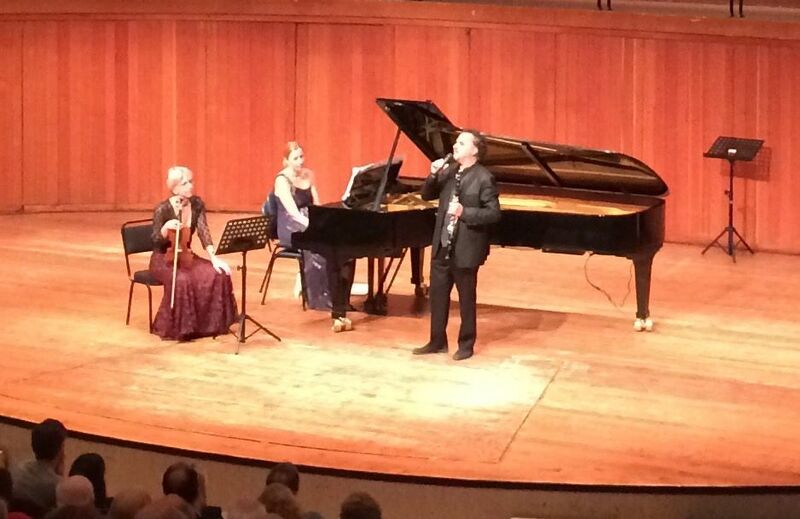 The dialogue was riveting – Krakauer’s lower register was sublime, and Tagg’s strong, sensitive, brilliant playing brought the sonata to a delightful conclusion. In the second item on the program, we began to see a side of this duo that has perhaps become their signature – the strong folk influence in the interpretation of Slavic works. And I was very glad of it, because this was the first performance I have heard of this piece, that actually made sense to me! Although sophisticated by removing the expectation of melodic form, the clarinet part is essentially a folk song. It was both refreshing and rare to see a “classical” performance of this work that embraced it’s rhythmic, “Unza” roots. Tagg fought the venue’s hard acoustics well to annunciate the many trills, runs, and rapid ostinatos. The opening F sharp, gradually accelerating in vibrato, was mesmerizing. A crescendo appeared, with no discernible beginning, and built from nothing to fff. Twice! The second time it broke into to the kind of bird song that defies understanding as to how the bird actually does that, let alone a clarinet. Messiaen likes his “fade up from nothing” and every time, Krakauer executed it literally “floorlessly”. Again I was reminded of Brahms hearing Mühlfeld playing, and being inspired to return to composing. Until now I could not tell you that such a variety of beautiful sounds can come from a clarinet. If Debussy is on your program, and you play Brahms impressionistically, you’re going to need another stop to pull! This duo pulled the Pacific ocean, with no sight of land, just the gentle rolling twinkling swell, and the sky. They are exquisitely balanced, each taking turns to be the boat and the ocean, and continued to dazzle, with amazing runs, exciting legato / staccato changes, and rippling arpeggios. Both understand the grouping of notes as impressions, as if the notes were brush strokes. Before beginning, Krakauer explained the guidelines of the piece they were about to play, where the traditional melody forms a base over which improvisation can occur. From the first note I was transported to the best wedding party ever! What is it about Eastern European music that is just so … catchy? Why was “Fiddler on the Roof” such a massive success? I can not help but philosophise over the occurrence that you can play the Unza rhythm basically anywhere in the Balkans, Eastern Europe, and the Near East, and the musicians you are jamming with will know what to do. Has it all come from one source – the cradle of civilisation? As the wedding Dance picked up pace, Krakauer let rip… What an incredible performer! In a tradition shared as far east as India, the song begins with misty atmospheric sounds and free improvisation (no time signature). Tagg re-appropriated the piano as a zither by holding the sustainer pedal, and with surprising accuracy, produced ethereal chords, like a distant lyre. When the rhythmic section of the song began, Tagg continued to revolutionise the piano as a tonal percussion instrument, creating the Unza by plucking the bass strings, dampened with her other hand inside the piano, giving the impression of a double bass. As the song progressed into a theme and variations, Krakauer continued to rip it up, taking care to outplay his previous improvisations (another feature of classical Indian music). Krakauer’s free improvisations were becoming increasingly experimental, and I am sure he was saving this concept for last: his introduction was an exploration of progressing melodic patterns, using circular breathing to play the entire exposition of around two minutes, with out stopping for a breath. The effect was quite trance inducing, much like the didgeridoo music of Australia. Long after we were all quite beyond belief, with an impeccable surprise entry, a wedding dance landed, strait out of a Kusturica film. Smashing plates and machine gun fire would not have been out of place! This entry was posted in Classical Music Review, Concert Review and tagged Andy Wilding, David Krakauer, Kathleen Tagg, Klezmer. Bookmark the permalink.